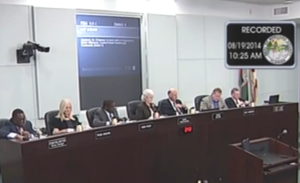 BREVARD COUNTY, Fla. — An atheist organization has filed a federal lawsuit against a Florida county over its policy banning non-religious persons from delivering the invocation at the start of commission meetings. “To deny anyone the right to offer an invocation at this meeting and segregate them into a public comment period, which is what they’ve chosen to do, can be seen by any reasonable observer as an endorsement of religion,” Central Florida Freethought Community spokesman David Williamson told local radio station WMFE. Last week, Brevard County Commissioners discussed a clarification policy proposed by board member Curt Smith, which reiterated that while the invocations would remain religious in nature, atheists would be welcome to speak during the comment period. “The board wishes to formalize a policy on invocations that is not hostile to faith based religions, and that does not endorse secular humanism, or non-belief of traditional faith based religions, comprised of constituents who believe in God,” Smith said. The board voted unanimously in favor of the policy, which angered atheists who opined that the rule was discriminatory. The Florida Freethought Community and the Florida chapter of the American Civil Liberties Union (ACLU) have now filed a federal lawsuit against the county over the matter. Smith says that he doesn’t believe that a non-religious group can rightfully accuse the county of engaging in discrimination.